Sly Owl just posted a peaceful diorama of two friends and their game. Having actually played Pooh Sticks myself, I can vouch for the mind-numbing addictiveness of the game. Awesome job, Owl, gotta love Pooh Sticks! looks funny.har har. 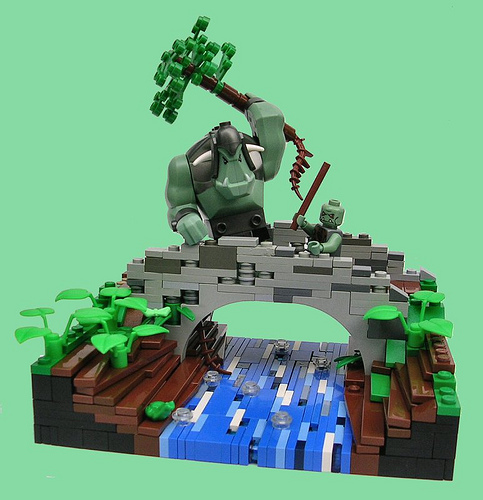 i get the feeling that the giant is tempted to throw the troll of the bridge.hehe good job. Awesome! I too, have engaged in the amazingness that is Pooh sticks. We used to play that with beer cans we’d just emptied. And then try to hit the beer cans with rocks after they emerged from underneath the bridge. Now I feel bad that I littered. That has to be the best vig I’ve ever had the divine pleasure of placing my eyes on. Neither won, as the tree clogged up the bridge. They didn’t mind-the splash was very satisfying. The little guy is eyeing the frog.